Sea water contains large amounts of salts, or minerals. These are left behind when sea water evaporates so water that falls as rain or snow is fresh (non-salty). Land-living plants and animals cannot live on salt water so it is important that there is fresh water on the land. People use huge amounts of fresh water every day, particularly in parts of the world where there is farming and industry. Most of this water comes from big, artificial lakes called reservoirs. These are made by buildings dams across rivers to trap the water. The level of the ground water is called the water table. In areas with plenty of rain, the water table may be just a short distance below the ground. In some parts of the world, people have to dig wells to reach this water and pump it out. When people change the natural landscape, they can upset the water balance and cause the ground to dry out or become flooded. Building towns and cities, for example, covers the land with a waterproof layer of asphalt and concrete. Instead of slowly soaking into the ground, rain flows into the drains and is carried straight to rivers. Because of this, the groundwater may fall and rivers may flood if there is heavy rain. Clearing forest for farming can cause problems too. The pouring of raindrops and pressure of tractor tyres may make the ground impermeable. Water flows over the surface and washes away the soil. The water balance is also upset if forest is planted where there was non before. The foliage cuts down the amount of rain that reaches the ground. 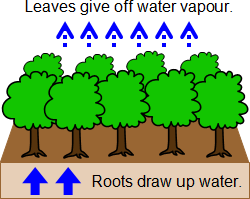 Also, water in the soil is drawn up by the tree roots.